Lathe turning light destined to work the object is small and lightweight. The shape of this machine is relatively small and simple to the length of the machine is generally not more than 1200 mm so it is suitable for domestic and industrial practice. Compared with light machine lathes, lathes are having a more detailed construction and fitted with special equipment. The lathe is being used for the job that has a lot of variety and rigor. The lathe of this type can extract material with a diameter of up to 200mm and 100mm long. Not only to produce tooling, lathe medium can also be used to repair tools and equipment suitable for use as a training school. Standard latheStandard lathe has a large size and heavier. This type is a standard lathe in manufacturing lathes in general. With components such as the light and medium lathes and equipped with cooling taps, work lights, sump burr, and brakes. Lathe most widely used standard in the home industry. Long bed lathe The lathe is used to do things big and long, and widely used for large factories. Center lathe Lathe center lathe most widely used in industry because it is designed for a wide variety of forms. The lathe uses a spindle shaft which has a chuck jaws on one side as the grip of the tool material. This became the central axis of the jaw and the other side into the player. Type lathe to rotate the belt using a belt gear. A belt wrapped around the gear and rotates with the rotation axis of the spindle associated with the belt. The gears are circled belt have been key to the manufacture of screw and cutting material because the tip of the series are included sledding gear cutting tool to form the constant moving around the screw. Lathe work automatically. Prior to working, lathe is only necessary to determine the final shape of each piece given by the operator and will subsequently turning lathe appropriate settings. The engine shaft will set its own grip on the material work material. By the way work is highly automated, you can easily keep an eye on some other machine very easily and quickly. With this automated way of working, enable users to use this type of machine. This automatic machine many have encountered in some industrial and manufacturing companies that need it. For the disc-shaped material, lathe facing lathelah choice. The lathe has a disc of a disc in the form of a large plate that is on the basic side, then the process of turning work on both sides of the disc. Turret Turret lathe has the ability to work in Identics material. Identics intent here is to work in accordance with the engine working order has been arranged by the machine operator so that it is suitable for mass production in the industrial material-insdustri. Turret type of saddle Almost similar to the regular turret lathes, turret lathe saddle type of saddle used to perform setup or operation to produce identical material. This type turret lathe can also produce materials with identical. Vertical turret lathes have bercengkram turntable and turret mounted on a rail crossing on the turntable. There turret heads on the side into a chisel with a system controller that is set so that the repetition of identical processes at the time of operation. A pedestal machineAlas machine is used as a place holder head off, sledding, stand still, and the pedestal funeral at the time of turning. Pedestal or table machine must have a flat surface, smooth and high accuracy of flatness and parallels. 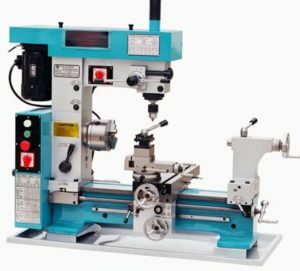 It is necessary to make an incision when performing head motion movement off the head and elongated sledge can run smoothly and stable so as to produce a precision lathe. The fixed head is located on the left of the lathe. In this section in charge of rotating the workpiece where there are transmission gears. The head remains at the heart of the placement of the essential equipment of the lathe, in which there are plate machine, crank regulator pair of gears, disc-rise, and the motor of the machine. In addition there is a dibble (chuck) or clamp, the tool holder of the workpiece that is safe when done. Dibble divided into two, namely dibble dibble jaw jaw three and four. The movement of the jaws clamp the jaws dibble three when we move the driving key is simultaneous, whereas four dibble jaw is moved by one. Head off to work to support long workpieces. This section is located to the right of the lathe. When the long-sized objects will turner, the possibility of bending very large objects that have to be supported at both ends. Sustaining performed by the head fixed on the end of the left and by the head off at the far right. Components in the head off, among others, the play center that serves to memompang workpiece in order to avoid friction, hand will, spindle lock, and lock the pedestal. SlidgeSledge used to perform funeral prose on the workpiece by moving to the left and to the right along the table. Sledge is divided into three parts, the longitudinal sledge or sled pedestal, sledge transverse (cross-carriage / cross slide), and sledding on or sledge combination (top carriage / compound slide).Elongated sledge function to perform funeral with the lengthwise direction toward or away from the machine spindle. This mobilization can be done manually or automatically along the table or board machine. Transverse sledge function to perform funeral with the transverse direction toward or away sumbeu flashlight automatically or manually.Sledge above or a combination serves to make the feeds manually towards the desired angle. When viewed from the construction, sledge sledge rivet extends transversely, and eretetan transverse sledge rested on. Thus if the sled is moved lengthwise, then crosswise sledding and sleigh above also come to move or shift. The first process is a shearing or cutting process early. This process cuts a sheet of steel plate of raw materials ie steel plate coil rolls into sheets of steel plates of various sizes. Shearing process can be divided into several kinds of straight cuts, oblique cuts and cuts in combination. Blanking adalah proses persiapan material, material dipotong sesuai dengan yang dibutuhkan. Proses blanking bertujuan agar mendapatkan hasil potongnya atau blank, sedangkan sisanya akan dibuang sebagai sampah atau disebut scrap. CuttingThat is a process that is still shaped cutting sheet material (blank material). The cutting process is a process of cutting some part of a part. The rest of the cuts discarded as scrap. TrimmingYaitu sutu proses pemotongan material pada bagian tepi. Biasanya proses ini adalah lanjutan dari proses sebelumnya seperti draw, stamp dan sebagainya. Notching.Notching adalah proses pemotongan pada bagian pinggir material part, biasanya pada progressive dies. Dengan pemotongan tersebut, part berangsur terbentuk walaupun masih menempel pada scrap skeleton. 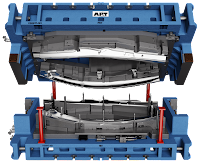 Parting or SeparatingParting or separating is the process of separation of a part into two parts or sections of the sheet metal strip so as to produce the desired part. In the separating process are scrap unused. Bending is a process of bending the plate where the results of this bending of a line in accordance with the shape of the desired angle. Flanging is the same as bending but the resulting bending line is not straight but follow the shape of the relevant part. This process is intended to strengthen the sides of the product or to reason, beauty. Forming refers to a more narrow sense, means deformation of sheet metal that is a combination of bending and flanging process. Forming process produces highly complex shapes by bending-bending and complicated contour parts. 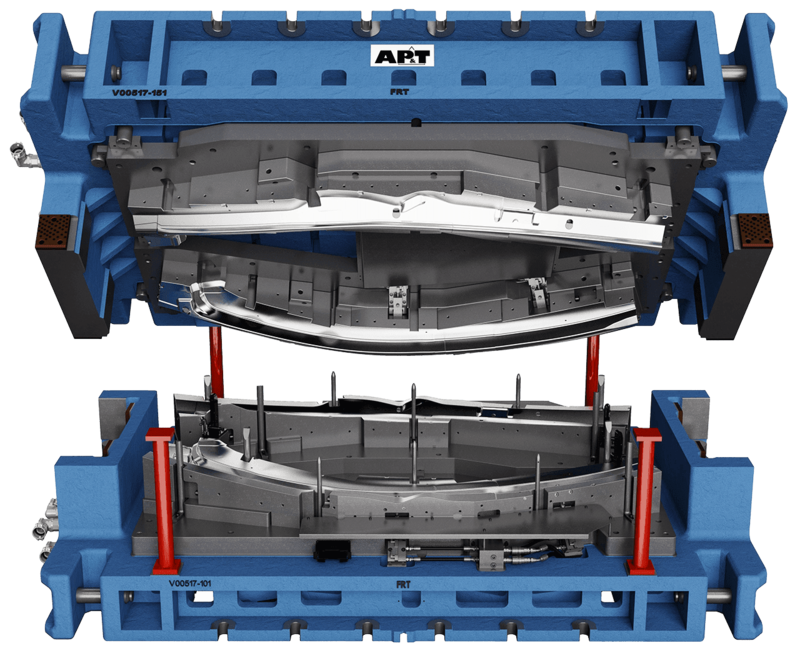 Drawing is forming deep enough so that the formation process requires a blank holder or stripper and water cushion / spring to control the flow of material. For irregular shapes bead necessary to balance material flow. To produce a good product, you should use special steel sheet and the drawing process using a hydraulic press machine. Deep Drawing a deep drawing process so as to get the shape and size of the final product is required several times a drawing process. Blank holder / stripper absolutely necessary and can only be processed on hydraulic press machine and uses a special metal sheet for deep drawing. Stamping or Marking.Marking or stamping or sometimes called a coining process is used to make signs, symbols, letters or other forms of cold forging process. Heading.Heading is the process of formation of the head part, usually on a bar of steel material. Forming process with the process hot forging or cold forging where the ends of the parts are processed by using the pressing dies to form the head. Sizing adalah operasi dimana material plat diberi tekanan tinggi yang mana menyebabkan material mengalir, karena itu sizing bertujuan untuk memperbesar akurasi dimensi dari part / benda kerja. Welding or welding is the process before painting or staining. Welding is used to unify each press part that has been created so that it can form a complete car body. The welding process is used alone done manually but there is also carried out by robotic arms. Types of welding used is spot welding, but there are also welding co but only in certain parts only. Painting is the last process of manufacture of the car body. Painting done with spray paint and dye. Ost spray painting also is automated with a robot arm. Shuttle loom is that loom where weft yarn is inserting through the warp yarn by the means of shuttle. It the above chart conventional and automatic loom is considered as the shuttle loom. 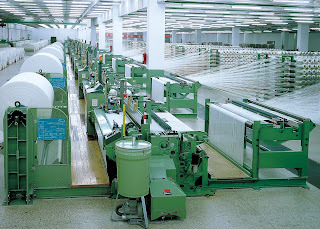 Special types of shuttle loom are short loom, broad loom, pile loom, gauge loom and tri-axial loom etc. 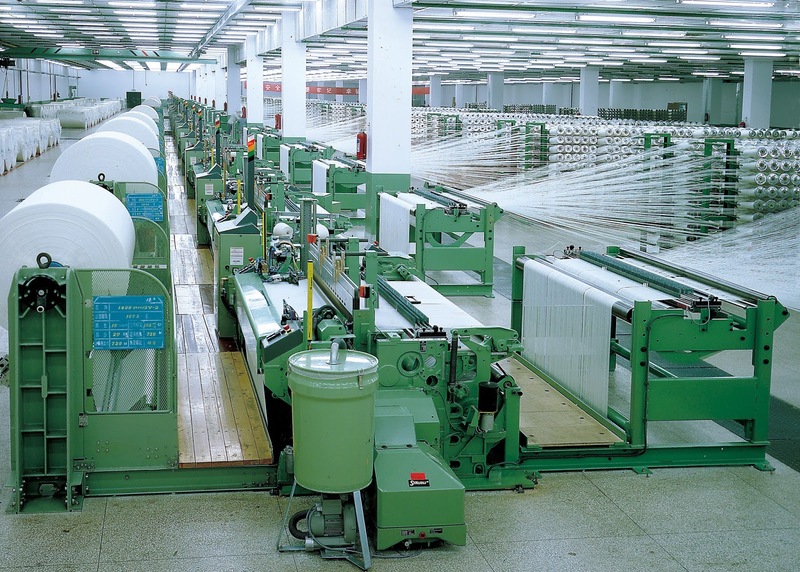 In a shuttle less loom, weft yarn is inserting through the warp yarn by the means of projectile, rapier, air or water. The entire shuttle less loom is called modern loom. This type of loom has more production capacity than the shuttle loom. 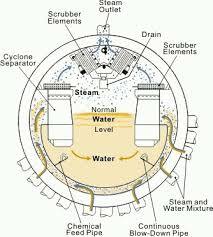 The boiler is a device shaped closed vessel used to heat water to produce steam (steam), heat from the combustion of fuel in the boiler will be transferred to the medium of water flowing in the pipes when the water temperature has reached a certain temperature it will happen evaporation. So can we interpret that the boiler is a tool that is used in letting steam, as we all know can be used to drive a steam turbine at a power plant and serves as pencaga temperature in the distillation column for petroleum. In this boiler has two parts therein, namely the tube that is the site of combustion and bagin barrel / cask containing the fluid. The fire tube boiler types have characteristics that produce a low amount of steam and a limited capacity. Principle Works: Process ignition occurs inside the pipe and the heat generated is delivered directly into the boiler containing water. Pros: The installation process is quite easy and does not require special arrangements, does not require a large area and has a low cost. Disadvantages: Have furnaces that are difficult to reach when they want cleaned, steam capacity is low and less efficient because a lot of heat is wasted. Has a construction which is similar to the type of fire-tubes, this type also consists of pipes and barrels, which menbedakan only side pipe filled with water while the barrel was the scene of arson. Characteristics of this type is to produce a relatively large amount of steam. Working Principle: The process of ignition occurs on the outside of the pipe, so that the heat will be absorbed by the water flowing in the pipeline. Pros: Has a large steam capacity, niali relatively higher efficiency and furnace easy to reach when they will be cleared. Disadvantages: The initial investment cost is quite expensive, requires a large area and requires additional components in terms of water treatment. This type has a fuel from petroleum fractions, with the characteristics that have combustion of raw materials more expensive, but has a better efficiency values ​​when compared primarily to the other. Working Principle: Heating derived from the combustion of a mixture of liquid fuels (kerosene, diesel fuel, residue) with less oxygen and a heat source. Pros: Has a little combustion residue so easy to clean and readily available raw materials. Disadvantages: Has the price of raw materials is expensive and has a construction which is expensive. Memiliiki type of fuel gas to the characteristics of the raw materials that are cheaper and better efficiency value when compared to other fuel types. Working Principle: The burning that occurs due to a mixture of fuel gas (LNG) with oxygen and the heat source. Pros: has the cheapest fuel efficiency and better value. Disadvantages: costly construction and fuel sources are difficult to obtain, must go through the distribution channels. From the name alone we must already learn that the heat source is derived from an electric tool, with the characteristics of the fuel which is cheaper but has a low efficiency level. Working Principle: Heating electricity supply comes from heat. Pros: Has the care that is simple and the heating source is very easy to obtain. Disadvantages: poor efficiency value and has a lower combustion temperature. So a discussion of the types of boilers based works, it is expected that this article can be useful for those who need, Thank you. Compressor is a tool to enter or send conditioned air to high pressure. The compressor is a mechanical equipment which is used to provide energy to the fluid gas / air, so that the gas / air can flow from one place to another continuously. Kompressor in the automotive industry is a tool to provide high pressure air. Kompressor in the chemical industry is a tool to help chemical reactions by increasing the system pressure. Kompressor in heavy lifting equipment that works pneumatically airfreighter is a tool to a power source. How it works by entering the air into an enclosed space, and at the same time space volume is reduced, then the pressure within the chamber itself will go up. Compressor with working methods Dynamic How it works by giving the speed at which the air is at room volume space remains, then at the same time the speed is converted into pressure. A reciprocating air compressors utilize a piston to compress air and store it in a storage tank. Based on the number of compression stages, reciprocating compressors are divided into single stage or double stage. In a single stage unit, only one piston is used to compress the air, while the double-stage unit, there are two pistons to compress air. In rotary screw compressors menggunkaan two helical screw rotors that spin or as a tool to compress (compress) air. A centrifugal compressor is also commonly called the dynamic compressor. Compressors of this type are typically used for high pressure requirements. Compressors of this type using the impeller to compress (compress) air. As a protection against mechanical influences from outside. As a patron and fulcrum / supporter of moving parts. As the seat of the suction and discharge nozzles and other stationary parts. Inlet wall is diafram (partitions) that are installed on the suction side as the inlet channel and is associated with the inlet nozle. It acts as a gas channel entrance at the first stage, then meterialnya be resistant to abrasive and erosion. Guide vane in place at the front of the first impeller eye on the suction (inlet channel). The main function is to direct the flow guide vane for the gas to enter the impeller with equitable distribution. Construction there is a fixed vane and there that can be set (movable) angular position with the aim of operation of the compressor can be varied and accomplished efficiency and high stability. Eye seals are placed around the outside of the eye of the impeller and at the fulcrum by the inlet wall. Eye seals always form a set of metal ring surrounding the impeller wear ring (see figure 4). Serves to prevent back flow of gas out of the discharge impeller (high pressure) back into the suction side (low pressure). The diffuser serves to transform the energy that comes out of the discharge speed of the impeller into potential energy (dynamic). For multi-stage impeller mounted between inter stage. Shaft and diaphragm as a shaft seal. 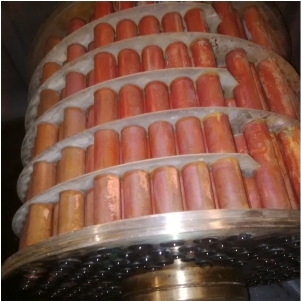 Casing and shafts as a casing seal. Return bend is often called a crossover that serves diverting the gas flow direction of the diffuser to return the channel to enter the stage / next impeller. Return bend formed by the arrangement of the diaphragm mounted in a casing. The return channel is a channel that serves to give the direction of gas flow from the return bend into the next impeller. Return the channel is equipped with fixed vanes with far goal swirl (eddy flow of gas) at the time of entry the next stage so as to minimize the vibrations, see figure 8. Diafram are components of the compressor which serves as an insulator between the stage and the seat of the seal eye and inter stage seal. With the installation of the diaphragm in series, will form three important parts, namely a diffuser, return bend, and the return channel. The diaphragm is placed inside the casing with a tongue-groove relationship so easy to be overhauled. Shaft or transmission shaft used to support the impeller and continue southwest of pengerak to the impeller. For placement on the impeller shaft in use pegs (key) and the multi-stage, positioning pegs are made alternately so balanced. While the distance between the stage of the impeller in use shaft sleeve, which serves as a protective shaft to the effect of corrosion, erosion and abrasion from the flow and gas properties and for placement between stage impeller shaft seal. Impeller serves to increase the velocity of the gas by means of a rotating, causing the style. This causes the gas inlet / flow from inlet tip (eye impeller) to discharge tip. Because of the change in the radius of the rotary axis between the tip of the blade in with a tip of the blade out then an increase in speed of energy. Bearing is internal compressor section that serves to support radial and axial loads that rotates with the aim zoomed friction and prevent damage to other components.